It is very encouraging to note that the UK economy looks set to bounce back after a softer patch of economic data releases that occurred at the end of Q1 2018. 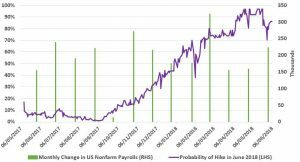 The Composite Purchasing Managers Index (PMI), based on survey evidence which asks companies about new orders, job hiring and inventories, has rebounded nicely. The Composite index acts as an indicator of future growth and is an amalgam of manufacturing, services and construction sectors survey data. The figure for the Composite PMI had been forecast at 53 – any figure above 50 indicates expansion and under 50 suggests contraction – but the official reading was much higher, coming in at 54.5. Soft economic data at the end of Q1 2018 had been mainly attributed to extreme weather conditions, the so called ‘Beast from the East’ and construction and retail sectors were hit hard during this time. The inclement conditions reduced footfall numbers in the high street and the dire effects also contributed to construction projects being held up. In terms of the services component, which accounts for the bulk of UK economic growth and dominates the survey, results were also very strong. The reading was 54, up from 52.8, beating Bloomberg forecasters who had predicted a reading of 53. According to IHS Markit, who publish the indices, the readings are commensurate with economic growth of 0.3% to 0.4% this quarter. First quarter growth was just 0.1% so this is a very welcome turnaround. It is ‘back to business’ for the UK indicating we are out and about spending more and enjoying life. The pickup in economic data will help build a more convincing case that the winter’s soft patch was temporary. However, the Bank of England (BoE) have acted extremely cautiously since the credit crisis. They do not want to take risks with growth, preferring to examine deeper issues to determine whether there are factors at work other than weather related effects. The BoE resisted tightening monetary policy at its last meeting in May after inflation undershot expectations. 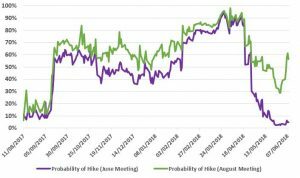 Their hesitancy reflected in economists’ interest rate forecasts and at the moment they see a very slim chance of an increase in June, but a better chance of a hike in August. The Bureau of Labour Statistics in the US has released their monthly report showing changes in employment. The figures released have been surprisingly good, sending a clear message that the labour market in the US remains strong. 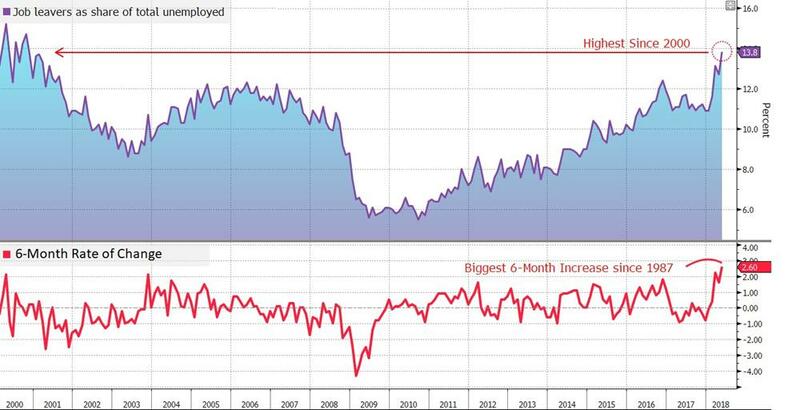 Unemployment at 3.8% is at its lowest level in over 18 years. Vigorous demand for labour is making workers more confident. They are looking for better opportunities as demonstrated below. The chart is based on the share of job leavers as a proportion of those out of work. It shows the proportion now stands at 13.8%, the highest since 2000, indicating that people are leaving their jobs confident that they will soon find better opportunities elsewhere. Momentum in the US jobs market continues to build despite rumbustious domestic politics, explosive geopolitics and a President starting a trade shooting war with long-time allies, all being potentially damaging to corporate confidence. In fact, 223,000 new US jobs were added in May, more than the forecast 190,000. This year 1.04 million jobs have been created, outpacing the same milestone by one month in each of the past two years. The question now is whether momentum can be sustained. If more jobs continue to be created, the pool of skilled workers will diminish at a faster pace. In previous cycles, when unemployment fell rapidly, wages increased, input costs rose and general price levels accelerated, i.e. we got inflation. Employees’ earnings have increased for the 7th straight month and the total increase for the year to the end of May has gone up marginally to 2.7% from previous figure of 2.6% in April. So, why are interest rates not moving higher at a faster pace? To decide on necessary policy actions the US central bank is carefully monitoring economic data, including labour market readings. Keeping interest rates ultra-low is less appropriate when growth and employment conditions pick up. Therefore, rates have been rising since 2015 with 6 increases taking the level to 1.50% – 1.75% range. However, at some point the Fed may feel the need to accelerate the rate increase. This may be required to signal their inflation beating credentials. They also appear to want more rate rises under their belts as the economy matures and reaches full capacity. Thus, in the event of recession or in response to a destabilising event, they will be in a better start position to lower rates again from a higher level. With labour market data for May being better than expected, market participants are forecasting a high chance (86%) of an interest rate rise taking place at the next Fed meeting on Wednesday (13th of June). If the pace of the US labour market keeps improving, downward pressure on unemployment and upward pressure on wages will intensify. 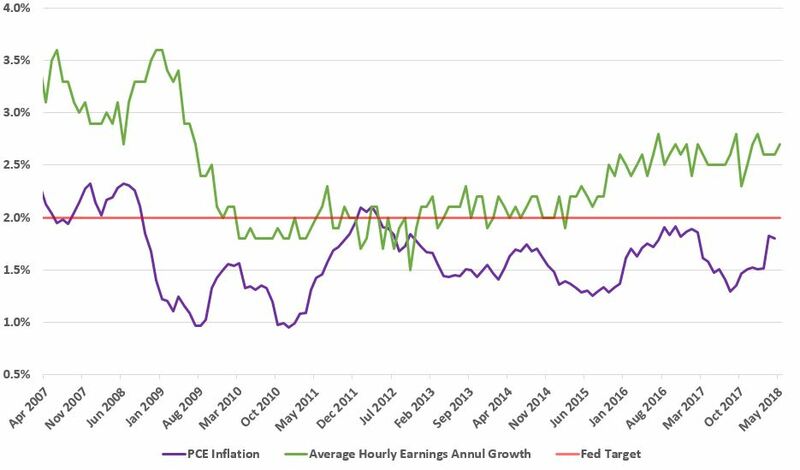 For now, the current pace of wage growth is still too low for the Fed to achieve their target inflation of 2%; measured by the PCE Deflator (Personal Consumption Expenditure) currently at 1.8%. 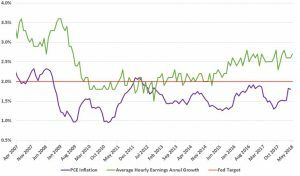 Historically, to achieve PCE inflation of 2%, average hourly earnings growth needs to be pointing north of 3% and firmly heading higher. Thus, we have one of this cycle’s conundrums; strong job creation has not translated into higher wages and higher prices. 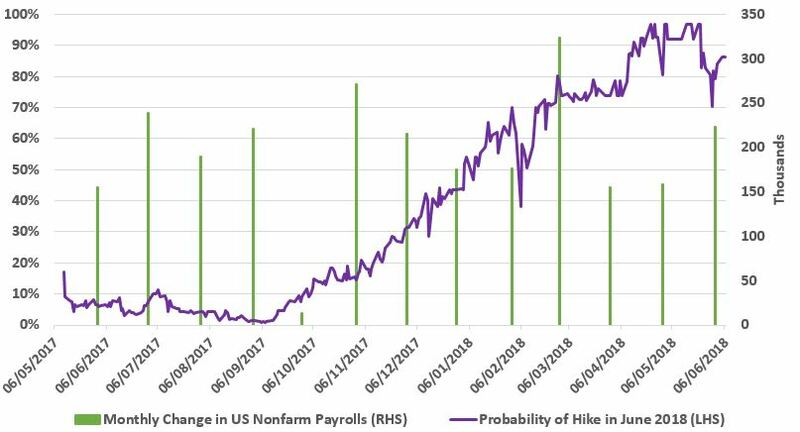 It will be interesting to revisit the Fed ‘s decision next week, to see how they interpret labour market trends and how this interfaces with the process of gradual monetary policy normalisation underway.